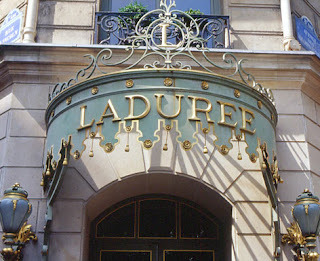 Velezita: Laduree, Otherwise known as Laa-Dee-Daa! If you like your waitstaff as cold as your ice cream, with less sugar, try Laduree at 75 Champs Elysees. They are said to be quite a treat, but a real chocolate connoisseur like myself can find good chocolate in almost any city. This place was all show and no manners. The chocolate was okay, but not fabulous. The artistic presentation is good, but the French got their reputation for being rude because too many tourists frequent this establishment. It was the only place in Paris where people were downright rude. If you want a chocolate fix that will fix you I reccomend Bistro Romain, on the Same avenue. The chocolate mousse there is worth the trip!